rocky's bru: Low Yat now! "Malaysians really must take a step back from being champion keyboard warrior kings and queens who effortlessly swing from being aviation experts to being pathologists to being forensic scientists to being flood relief experts to being earthquake and seismic activity experts to being bankers and economists." Anti-crime activist Dave Avran is quoted as saying that PDRM and MCMC need to track down and bring to book each and every website, online news portal, Twitter account, Whatsapp account, Messenger account, Facebook account, Youtube channel and Instagram account that tried to twist the Low Yat incident into a deadly racial confrontation. "Having free access to social media channels does not automatically give you a license to inflame, incite and act in a totally irresponsible manner." All and good, but the question remains: Does the Government have the political will to see this through? I woke up this morning wih a feeling of profound gratitude to the Polis DiRaja Malaysia for keeping the Low Yat incident to just that, and not something more serious and deadly. And it could easily have (been) spun out of control. The Inspector General of Police's use of the social media via his Twitter account to appeal for calm and tell the people that the scuffle had nothing to do with race was most commendable. Not so the attempts by some quarters to take advantage of the incident to stoke the racial fire. To bring back the ghosts of May 13. God knows there are people out there who want the Malays and the Chinese to kill and maim one another. And these scums, their number is small but they have a powerful weapon in their possession: the smart phone. With the phone, they have access to the social media. This weapon, coupled with Malaysians' inherent gullibility, made stoking that racial fire the much more easier. If the Police had been less than effective last night, we could have woken up to very bad news this morning. Things are now under control though I doubt may of us would be going to Low Yatt anytime soon. The thing is, we know it will happen again, unless the authorities punish not just the those gangsters involved in the fight but, more importantly, those who tried to turn this stupidity into something even more sinister. The authorities need to stop the abuse of our social media freedom now. Regulate the social media. Yes, REGULATE. And bring to book each and every website, news portal, twitter account, FB account, instagram etc that tried to turn last night's melee into a racial confrontation. We gotta teach these scums a lesson, or take responsibility when they turn the next little gang fight into a "race thing". For once, Datuk, I respect you for making a principled, just and fair post. Today, you were a Malaysian, and a blogger for the people. Well done. Some of the linked blogs in your sidebar are guilty of unethically stoking the racial angle that you have described and condemned. In this case, they can take a leaf out of your book. Let's look after the people, of any and all races. We'll only go backwards as a nation, otherwise. YES! Lets start with people who spread FITNAHS on social medias about the leaders in our government...even those that travel to Singapore to CONSPIRE about the downfall of the Malay-led Government. and your uncle najib took out ISA. no wonder. What actually spark the incident , oh! ,that not the issue , how well to solve the issue . Bru , you link this post to IT. SCHEIS. IT has a link to PARPUKARI. Is this intentional. I just got back from Low Yat Plaza in which the vast majority of outlets had closed all day today. One of the staff of one of the handful of outlets which were open, as well as the Information desk person on the ground floor told me that the mall had decided to take Monday off. I arrived at around 5pm and was shocked to see most outlets on the ground floor closed.I then proceeded up to the upper ground floor, then the first, second, third and fourth floors and found most outlets closed. It was a surreal scene especially for a mall which opens till 9 or 10pm seven days a week. Unfortunately, I forgot to bring my camera or I would have taken lots of pictures of this "historical" scene. I understand that they will resume normal operations from tomorrow but whether there will be any more trouble is left to be seen. Curi atau fake phone....see for yourself before jumping to other conclusion. You just cannot sweep the natives disatisfaction under the carpet. Brushing off the natives complaints of cheating by the chinese traders will not solve these perennial problem. As the British sharply observed when they brought the chinese coolies to work in their mines and Indian labourers in rubber estate, the Chinese are thieves and the Indians are drunkard. So the right of the natives to be heard cannot be sacrificed for the chinese pendatangs to make easy money. Human rights must be preserved against colonialism of the Christians who brought these coolies for the native Malays rights. Their land have been slowly but surely grabbed by the chinese pendatangs. This may hurt some chinese but most are looking to make money and move on from malaya that their poor fore fathers came to in time of poverty. "Bru , you link this post to IT. SCHEIS. IT has a link to PARPUKARI. Is this intentional." "For example, this one which is in the Malay language and alleges racial undertones." "LIVE DARI LOW YAT PLAZA! MASA UNTUK MENCARI PENIAGA YANG KUAT MENIPU MELAYU!" 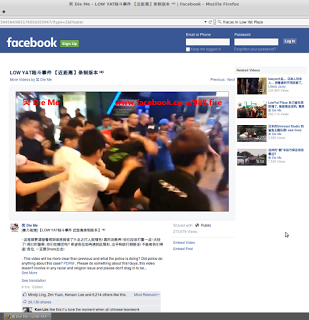 It does not require rocket science to know from the shouts in videos of the fight on Saturday that there already was some racial dimension in them and the demo by 200 people in front of Low Yat Plaza on Sunday evening definitely had racial dimensions to it which is concerning. Imagine what would have happened had the police not managed to stop the demonstrators from charging into Low Yat Plaza on Sunday. That incidence is actually overdue . We all knew Low Yat is a place of corrupted and ill intended bizmen prying out fake biz . It has been there for years and yet everyone close an eye on it . It just need one sensible and brave guy to open the box and all hell broke loose . It will happened again for sure , as long as the corrupted , ultrakiasu bizmen continue to operate there . This is the result of you politician championing all this year.From the socalled vernacular school,race based party etc is pot waiting to burn.Yeah some of politician can boast their so called success in their previous election but race based party can't go far and will create complicated consequences if not handle properly,Political rhetoric ,racial slur that you politician create are making deep dented in the heart of commoner which waiting to explode went the times comes. You all politician either government and opposition are to be blame because today win didn't ensure tomorrow prosperous & peaceful as long as you championing your own cause which is half baked success. Your views and believes plus those of your bloggers, are not helping to impede this incident from happening. I noted that from the police investigation, there's nothing racial in the incident but merely a thievery. I will still stay away from Low Yat nonetheless and advise my friends and kins to do so too, not because of anything racial but for feeling unsafe just being there. Imagine, if you are a legitimate customer and found out being shortchanged or sold a fake product. Do you argue with the sales clerk? If you do, there's every possibility of being accused of stealing and then every sales clerk in Low Yat would gang up and whack you to a pulp. My advise is, STAY AWAY. Low Yat had lost it's integrity with this incident, no matter how isolated.